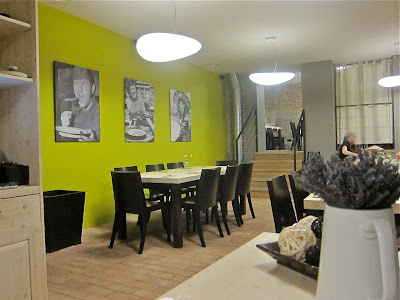 In early 2008, the only Thai restaurant I considered worthy in Vinohrady closed down. Tiger Tiger's Pad Thai and red curry chicken were favorites, and I was a regular eat-in and take-out customer. Oddly, after it was gone, there was no other serious Thai restaurant in that upscale neighborhood or even in neighboring Žižkov and Vršovice. Sure, these days you can pick up some Thai-like food at Sushi Tam Da or Sawadi, but it is mostly stuff would not try more than once. As far as I'm concerned, there hasn't been any serious Thai food in this part of town for years. When I wanted Thai, I'd go to Noi, Modry Zub, Lemon Leaf or maybe Siam Orchid. 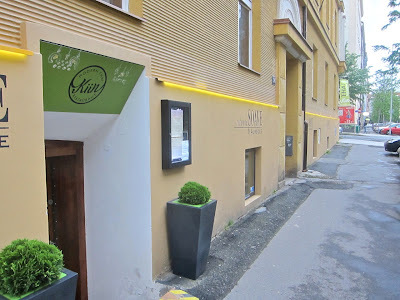 So I was quite intrigued when I saw that Kiin Modern Thai Restaurant had moved into the large space once occupied by Ristorante Soave. It's in the neighborhood between Flora and Jiřího z Poděbrad. 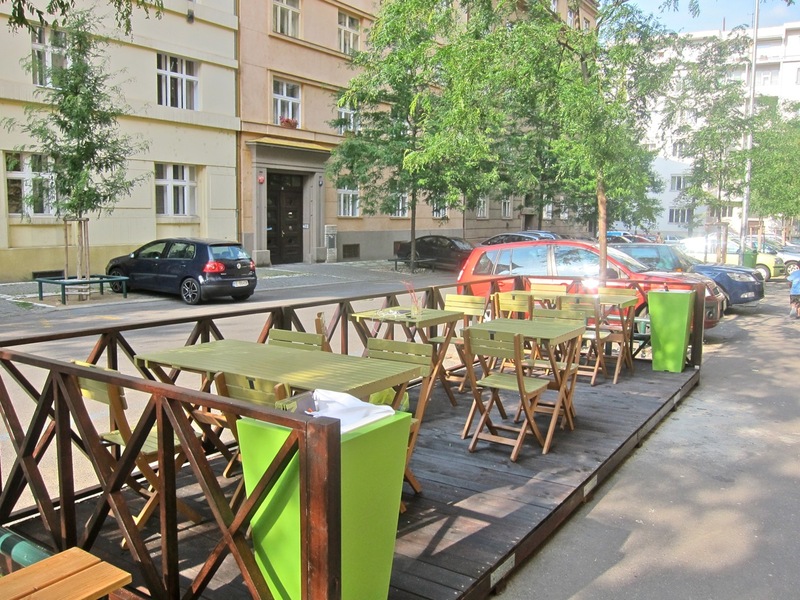 During the warmer months, they have tables set up outside. 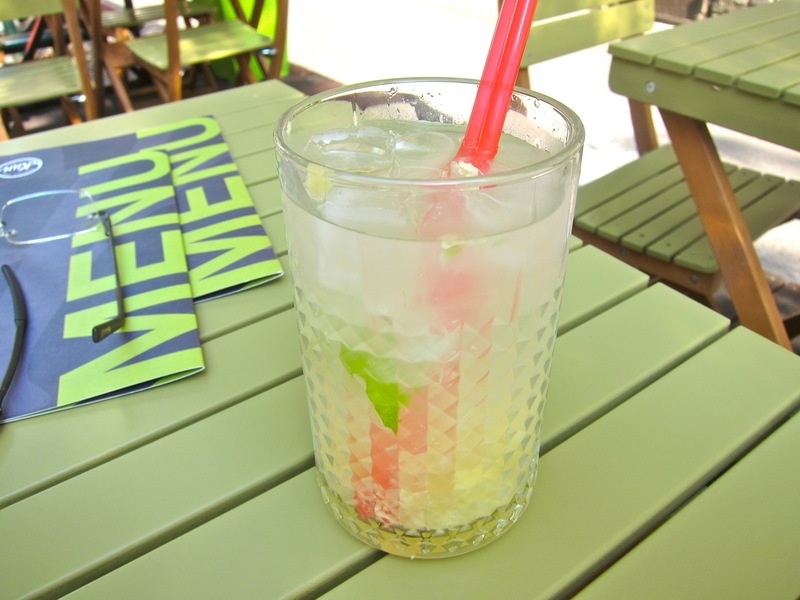 I really liked sipping their homemade lemonade with ginger (49 CZK) out there on a sunny day. It's not too sweet (though they can make it sweeter if you like), with plenty of sharp, freshly-grated ginger at the bottom. The fresh mint lemonade (49 CZK) was equally refreshing and commendable. They also had a "white sangria" I found too sweet. 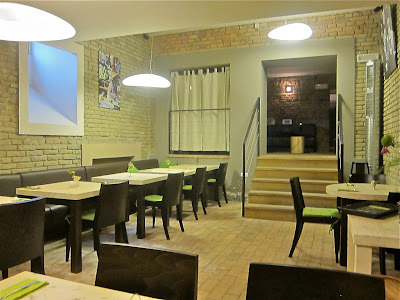 Inside, the spacious restaurant looks much the same as it did during its Soave days. 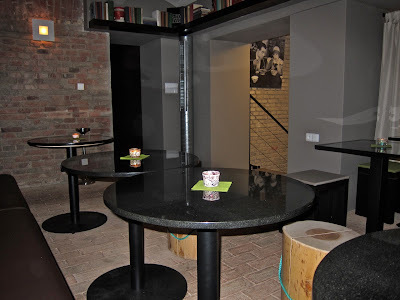 There is a small, darker, somewhat intimate space near the bar area. Then there is a larger, brighter space with modern furniture and neon-green walls and accents. 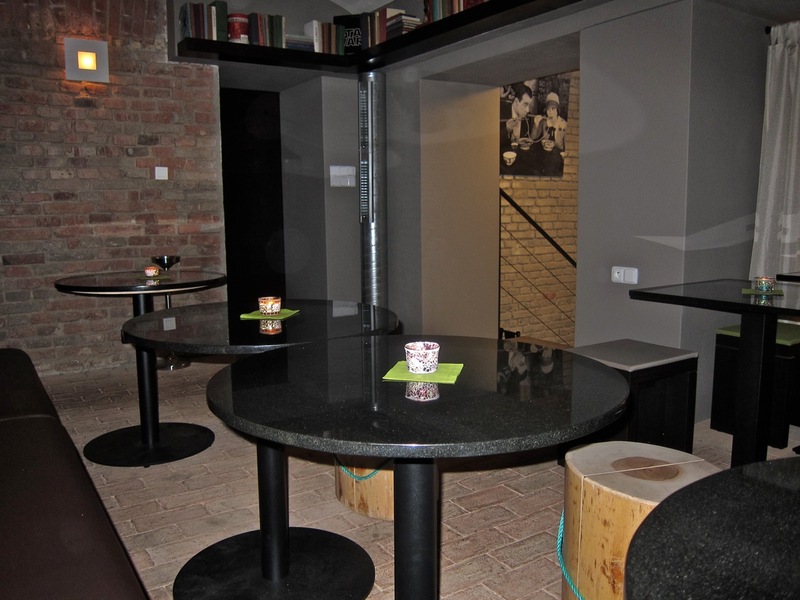 There is also a semi-private dining area in the back. I made five separate visits and ate my way through a lot of the menu, which has cute names for many of the offerings. I tried the Pok Pok Wings (69 CZK). I'd recommend this little starter. They were very spicy, with sliced red chilis mixed into the sweet glaze. 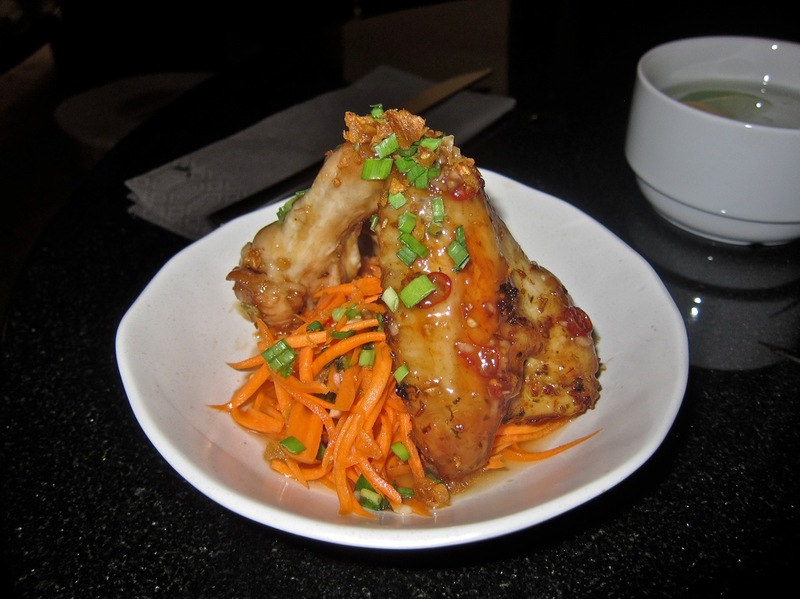 The two full, unseparated wings sat on top of a carrot salad with the flavors of citrus, fish sauce, and lime leaf. It's a small dish, but there was big flavor. 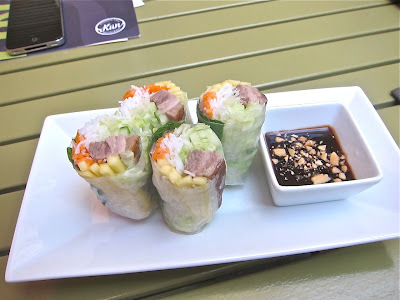 The "Daisy in Pyjama" (90 CZK) was a nice twist on Vietnamese-style summer or salad rolls. The cool rice paper was filled with cold, sliced duck breast, mango, and mint. Inside, there was also carrot, cucumber, and rice noodles. There was a hoisin dipping sauce. The mango could be riper and sweeter. A bit of the duck was too hard and chewy. But I'd get it again. 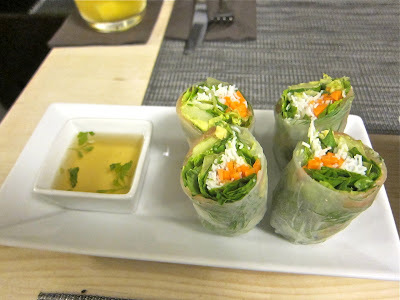 They also do a cold roll with smoked salmon (79 CZK). I found that one more mundane. 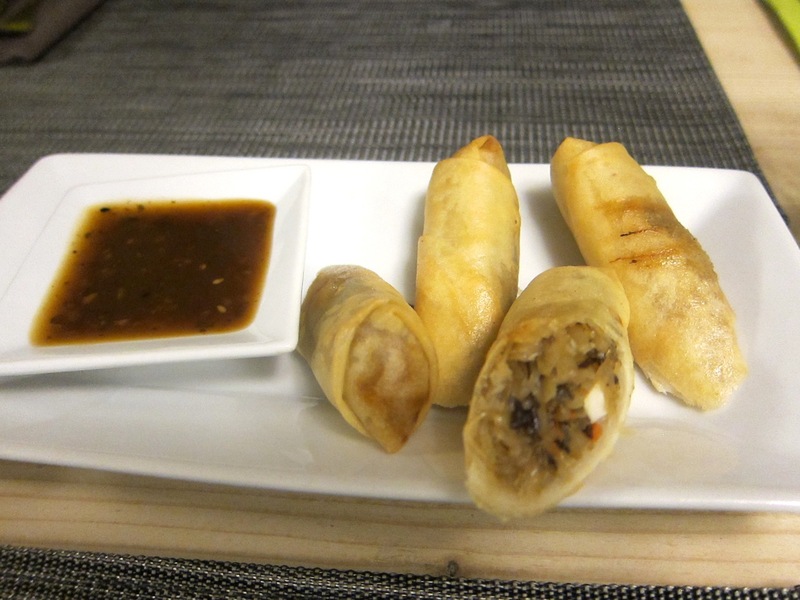 If you like hot, fried spring rolls, you could go for the "Gold Fingers." These were filled with taro, a starchy root vegetable, rice noodles, and vegetables. The soy-flavored dipping sauce went well with it. 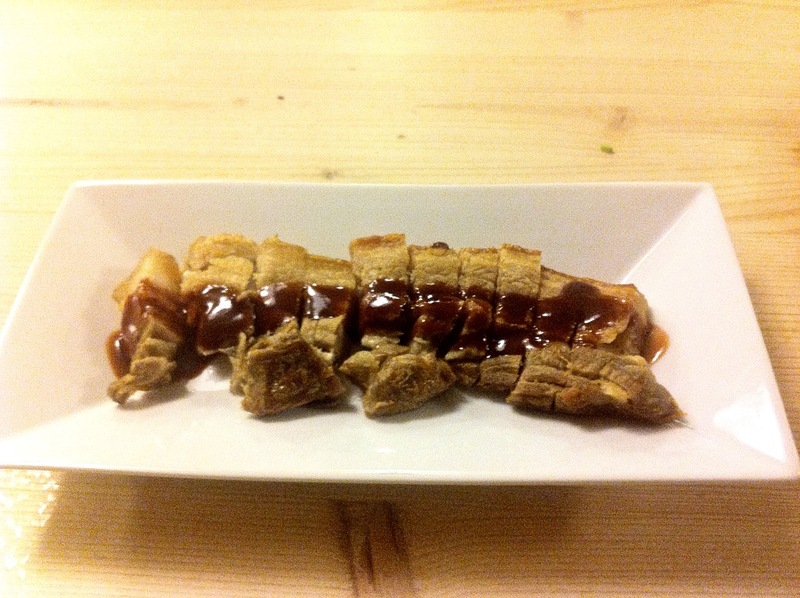 The Sun Burn (75 CZK) was described as moo krob or "crispy, pork bacon and honey mustard sauce." This dish was less successful in both execution and description. It was barely warm, dry slices of crispy pork belly. The sauce had no semblance to honey mustard, but was more of an Asian barbecue sauce. Apologies for the poor iPhone photo. 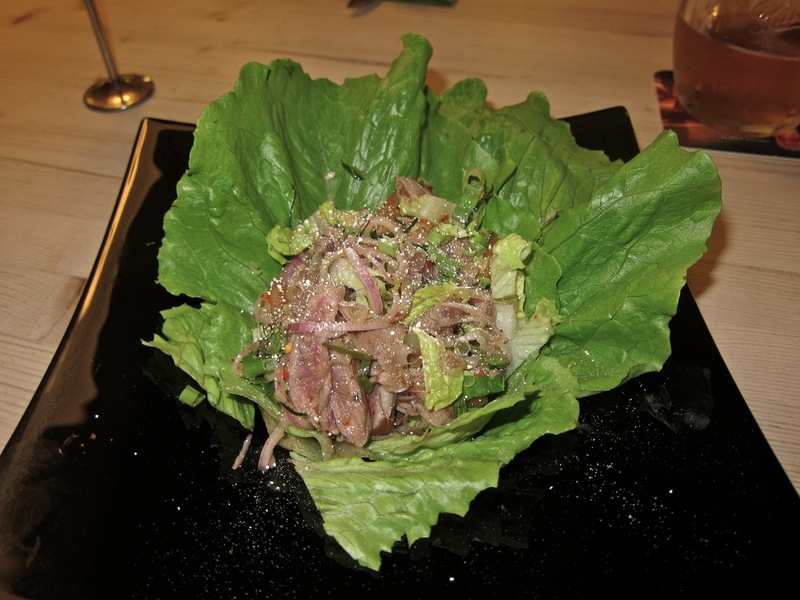 From the salad section, I tasted the "Crying Tiger" (145 CZK). This was a generous portion of warm flank steak with red onion, lime juice, fish sauce, green onion, and lime leaf. It was very tangy and the red chili spice level was seriously high, which I liked. Although cooked to medium, the beef was disappointingly chewy and tough. I mentioned this to some international foodie-types I met on a later visit, and they told me theirs was tender. So maybe I had bad luck. 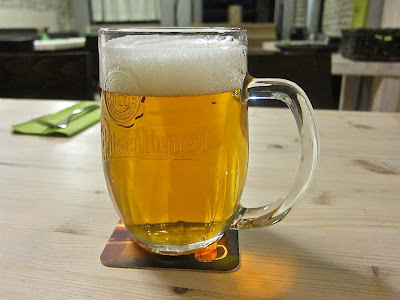 On many visits, I had a half-liter of Pilsner Urquell (35 CZK), which they have on tap. The beers were almost always perfect, chilled to the right temperature, with a sharp sparkle as it went down. However, the last time I tried it, the beer was not as well-poured or as cold as the previous visits. 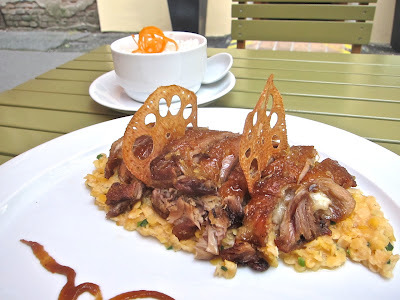 One dish that I liked, but could be even better, was the "Lonesome Heart" (185 CZK) This was a roasted duck breast glazed with chili, garlic and ginger sauce, served on a bed of red lentils mixed with coconut milk and red curry. It came with a bowl of rice, which I found unnecessary and went uneaten. The duck skin was nicely crispy, though some of the meat underneath was dry. The lentils had light sweetness and a slow-building spicy kick. They worked well with the meat on the fork. I'd get it again. I also sampled the "Canard Enchainé" (175 CZK). This was roasted duck leg served with lychee red curry sauce and rice. My friend liked it. I thought it was too sweet. Pad Thai is one of my favorite dishes and something I use as a benchmark to judge a Thai restaurant. 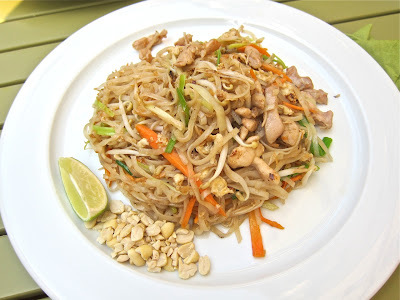 I had Kiin's Pad Thai (150 CZK with chicken) three times -- twice for take-out and once in the restaurant. It was OK, not great. The noodles were lightly sweet, which I like, and the requisite egg, bean sprouts, carrots, and green onions were in there. On the downside, the peanuts were too roughly chopped and didn't mix in well. There was a lime slice, but I wished for more citrus and salty notes in the balance. For me, the standard-setter in Prague is still at Noi, which almost always balances the flavors well and includes smoky strips of tofu in both their chicken and shrimp Pad Thai. The last issue with Kiin's, and it is not a small one, is some of the noodles were only warm and some were actually cold. I enjoyed the "shoryuken" (195 CZK) more than the Pad Thai. It was homemade rice noodles with flank steak, asparagus, green onion, broccoli, carrots, and bean sprouts. There was a hint of sweetness combined with a bit of soy saltiness. The noodles were on the soft side and it was also unevenly heated. But the deliciousness outweighed the defects. The Sweet Sticky Rice (59 CZK) was a fun and satisfying choice for dessert. It was served in a cool-looking glass with its own glass cover. 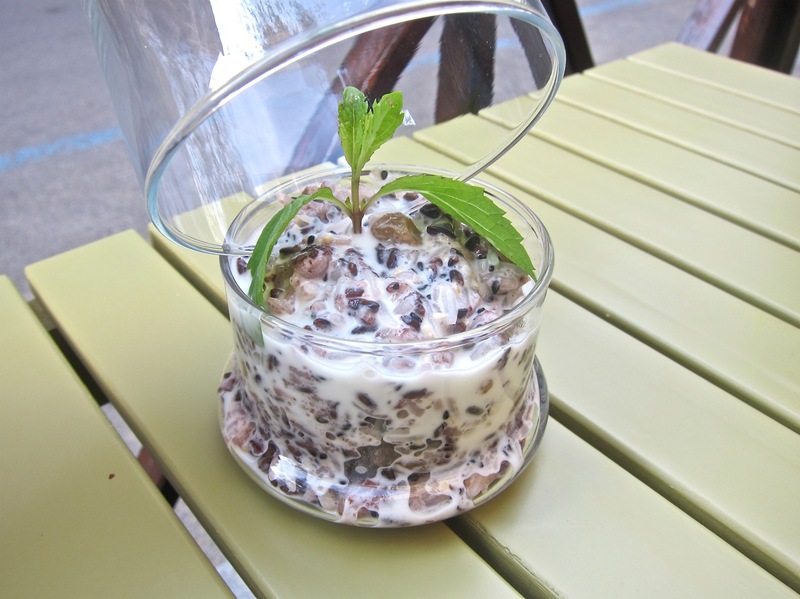 Inside was a mix of black and white rice, raisins, amaretto, sesame, and walnut. It tasted like a fancy rice pudding. 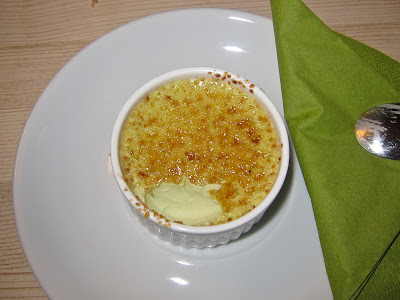 Although it was small, I'd recommend the pandan crème brûlée (55 CZK). It was super-creamy and they went very light on the sugar. The pandan leaf gave it a green coloring and I thought it had a green tea-like flavor. The service I experienced was very good. I had the same male and a female servers on most visits. They were very helpful, friendly, and charming with a sense of humor. These two definitely added to the warm, neighborhood feeling of the restaurant. On my first visit, I was told that the kitchen staff included cooks from Modrý Zub and SaSaZu. That, of course, will raise expectations for some. Those expectations should be tempered. Kiin's kitchen needed to be more consistent. Some dishes, like the duck and red lentils, were very tasty. Some were dry, including the same duck and red lentils. Several offerings weren't heated properly. The pork belly and lamb satay didn't thrill me. 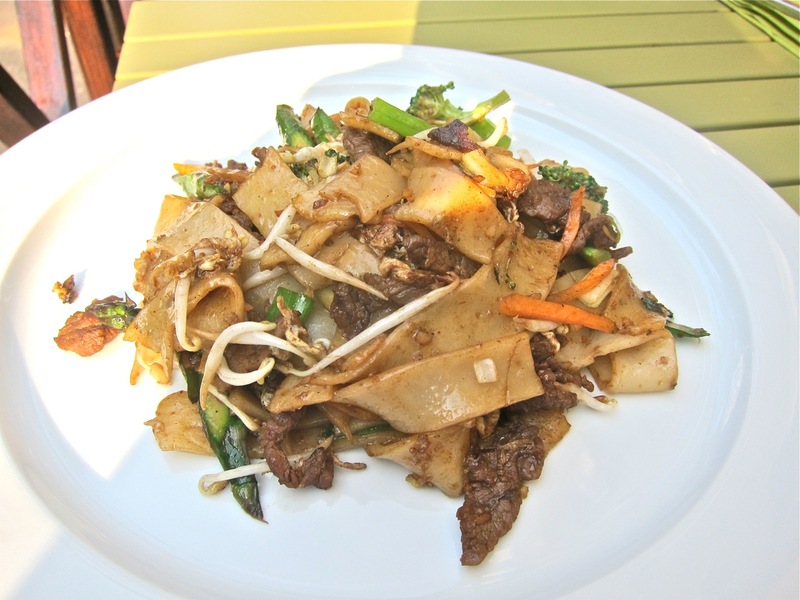 The Pad Thai could be better with a few tweaks. Yet, there is nothing like Kiin in this part of town. Some of their offerings are unique, with combinations of flavors you'll find nowhere else in Prague. 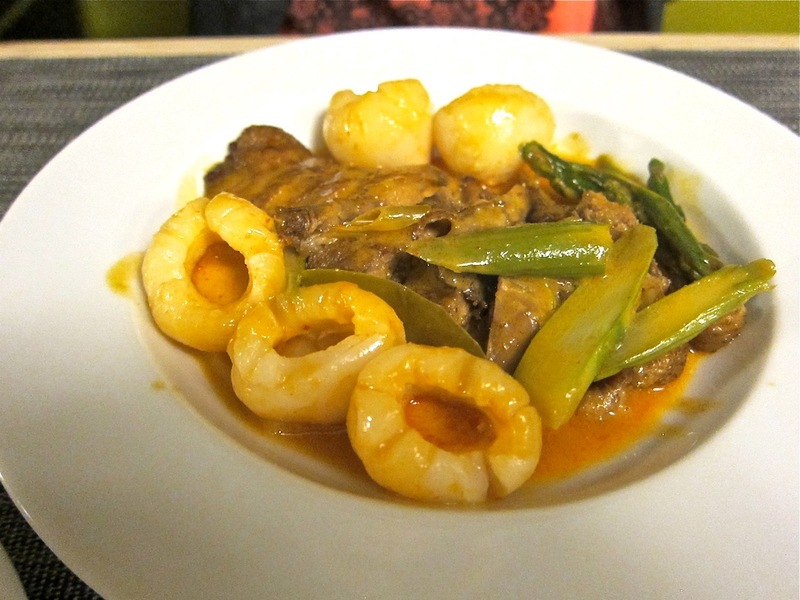 Many dishes were not large, but I still thought the prices were very reasonable. Kiin is still relatively new, having opened in May. I'm hoping they'll iron out their imperfections, combining imagination with consistency to make their restaurant the star of the neighborhood. I love your photos and descriptions. The lemonade with ginger sounds amazing!!! 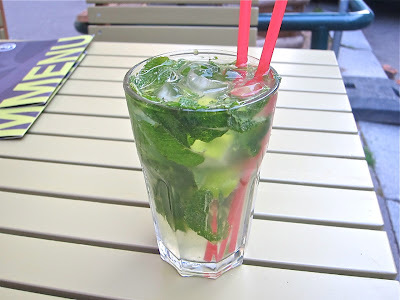 It became our local favourite, yet, after a couple of months, I must say that they are already suffering from what happens to a lot of good places in Prague. We were waited by staff which was either undertrained or undermotivated, in any case, it devalued the feel-good impression (food was excellent and so was the wine, which is not usual at this price level). the waitress first took my plate while my partner was still eating, then she left us unattended for about half an hour (our water run out, our candle burned out and we could not order a dessert) after which she had the balls to advise us where to put the tip. I would still give them a chance, though.